FM'd self-oscillating Cwejman MMF-1 filter sent to both a mixer and the M12, All Pass out returned to mixer. 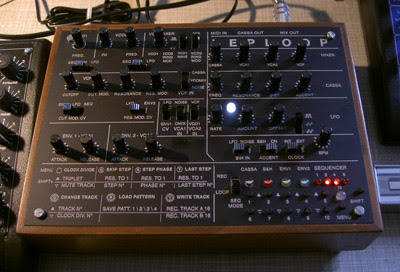 Gated by a Bananalogue/ Serge VCS which is responsible for much of the sequence's funk due to its inability to re-trigger. The phase cancellations are clearly audible at around the 10 second mark as I fade in the all-pass signal to the mix. This last clip demonstrates the Model 12's characteristic 'vactrol fuzz'. An FM'd Hertz Donut is fed into the filter, Maths sweeps the cutoff while I manually adjust the filter input level. I also compensated for the increased volume at higher fuzz levels by turning down the final VCA accordingly. Normally, this is just the right amount of fuzz for my liking but, if you remember this, you'll know that the M12 is capable of some truly molten sounds. Sounds fantastic and begs to be tweaked. The fact that no-one in the shop knew how to programme it added to its allure and the fun-factor. I've got to have one of these! 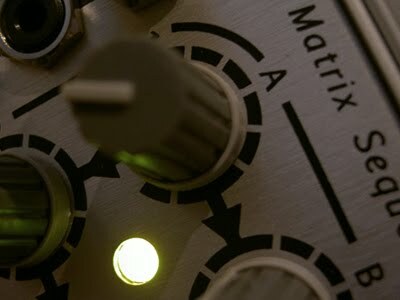 See also this Matrixsynth post. 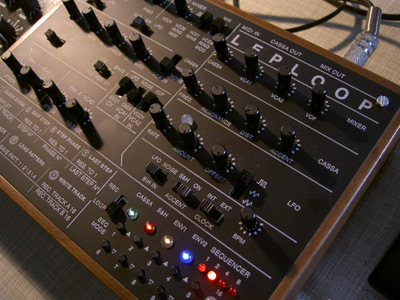 8-note polyphonic patchable beast of a synth. Looks stunning, but unfortunately I didn't get a chance to play with it. More info and sounds at the Mungo Enterprises site. Introducing Hubert, a DIY pressure controller. "Each channel has three outputs: CV Out, Inverted CV Out and Gate out. Each side is capable of holding the current voltage on CV Out, whereas the inverted CV appears on Inverted CV Out. If a CV is held in the CV Out you still can use the inverted out, even switching from positive to negative voltage as often as you want without disturbing the held CV output." 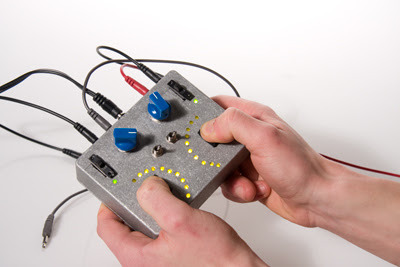 The hold function exhibits minimal droop and is key to working with Hubert: you can set a voltage with the pressure pads, sample it and then use the second output to generate another voltage on the same channel. This gives you a total of two dynamic and two static CVs. I'm looking forward to getting my hands on Make Noise's Pressure Points but, having seen Katavist's wonderful BugBrand CTL-1/ Wiard JAG demo, I'm beginning to wonder whether it offers the full monty viz. its current lack of sequencing options. Also, despite the allusion in the name of the Make Noise module and the controller description at the BugBrand site, neither of these interfaces actually respond to pressure. This might be semantic hair-splitting on my part but, as you can see from the Hubert demo video, there really is a different feel to playing a device with genuine pressure sensors. Zauner are currently working on a second revision which will include two independent manual gate buttons and threshold level pots for the pressure-activated gates. Free-running noodles are all well and good, but what if you want more control over the events in a complex patch? Today's Patch of the Day revisits Morton Subotnick's ghost tracks technique, first in its original form using an envelope follower and then MIDI CC > CV automation. This first recording comprises three multi-track takes. I used a mic patched into an A-119 Ext In/ Env. Follower and fed the resulting CV to different voice parameters e.g. volume, filter cutoff, FM depth, clock VC etc. This involved a lot of barking, howling and clucking into the mic and was a lot of fun. Nevertheless, this method has its limitations. Firstly, it works best with short, staccato bursts - sustained notes take a lot of breath! You could slew the tail of the envelope, but this alters its original shape. Also, you are limited to a single control voltage. This meant that I found myself reaching over to the modular to alter, say, the pitch of a VCO while bellowing into the mic. I wanted to be able to play all voices simultaneously and react to the changes dynamically, in other words jam. With just one set of vocal chords and mic/ envelope follower combo, this clearly wasn't going to happen, so I resorted to configuring some MIDI faders and the Aux outs of my Kenton Pro 2000 II. This is a live stereo recording of a four-voice patch. Admittedly, this method is a departure from the original concept as the faders & CC/CVs are nothing more than an automation remote control for the modular. However, the movements are recordable and, having the MIDI controllers conveniently in one place, meant I could 'conduct' all voices in the patch. 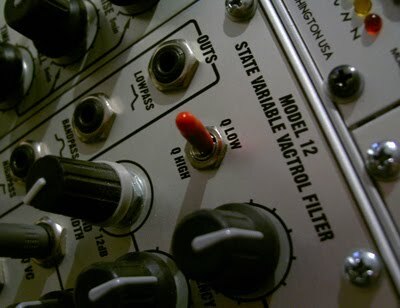 To add a few unpredictable elements, I cross-multed some of the CVs and audio sources so, for example, a CV that decreased the pitch of one VCO also increased the FM index of another, unrelated voice or, another example, the carrier of a ring mod duo also acted as a modulator in an FM voice. Funny how things come in waves. The last breaker brought us envelopes, the next threatens to flood us with sequencers, programmers and control devices. The Z8000 is billed as a matrix sequencer/ programmer and offers ten independently-clockable lines of CVs. Given its price and relatively compact size, it is a remarkably flexible and affordable package. You can find out more on how the Z8000 works here. 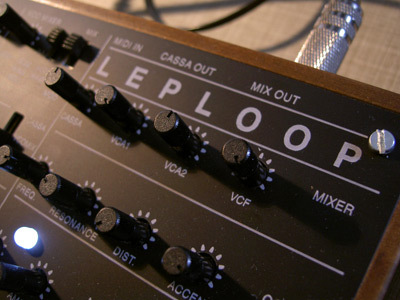 Rows 1, 3 & 4 were clocked by an LFO and subdivisions generated by a Doepfer A-160/ 1 combo. I used a Bananalogue/ Serge VCS to delay the gate for row 2 to provide some syncopation. A manual gate was used to change direction and reset individual rows. As I say, it takes some getting your head around! The reason this is relevant should be apparent: any change you make to an individual sequencer row/ column will have repercussions in the matrix, so beware. Four VCOs, tuned to the same root note. At about the 3 minute mark, I introduce a fifth voice taking its CV from one of the aggregate outs. I then change my mind and try the other out! As you can hear, the Z8000 is very hands on, certainly this jam was made by the fact that all pots were directly accessible, unlike the P3. Four VCOs, four rows each with the same pot values. 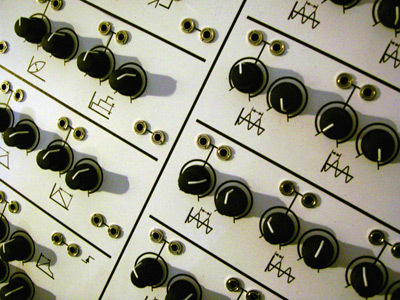 The burst out of a Wogglebug and an A-151 sequential switch were used to reset the rows and thus shift their relative positions. VCS, Maths and A-160/ 1 used to provide gate delays/ divisions. The Z8000 is well-built and laid out and looks fantastic. The knobs are clean and responsive and offer enough clearance for the 'large-fingered'. It packs an astonishing amount of sequencing into 28HP. So, what's not to like? Some might bemoan the lack of gate outputs, but this can be overcome by taking a mult of the gate signal via a Stackcable or other clock sequencer. I would have liked VC step addressing and wonder whether this and the direction function couldn't have been implemented as it is in the A-152, rather than via a gate signal. I do, however, like the fact that the method used means that one row can be programmed to provide direction triggers e.g. a pot tuned fully CCW = forward, above a certain threshold = backwards. In use, my largest frustration with a module featuring ten separate sequencers was the lack of a global reset! Ironically, I used a muxed manual gate from my A-Sol SQ-8 to solve this. If you're particular about this sort of thing, you should know that the Z8K resets to step one, meaning that the first step when clocked is actually step two. 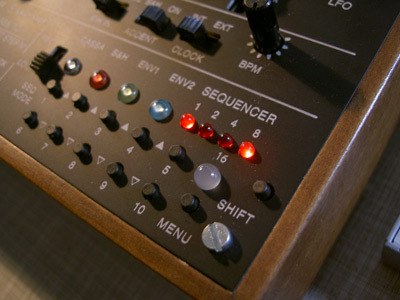 The work-around here was to use the SQ-8 to step all sequencers to position four. 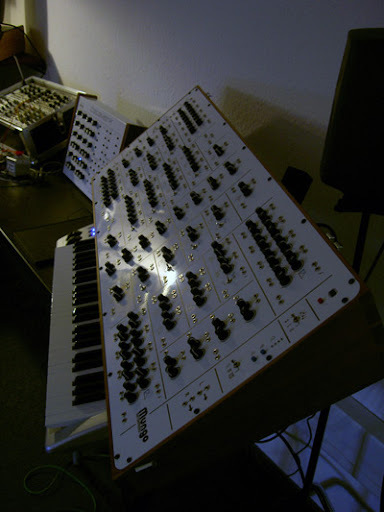 My last observation is actually not related to the Z8K but Doepfer's A-160/ 1: because of the way it counts, I failed to get a sequence to go forwards and backwards in equal measure, pendulum style. 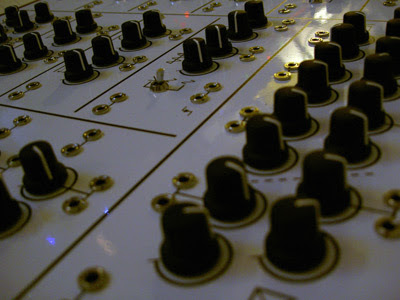 If you understand German, you can read more about the problem in this post at the sequencer.de forum. As TTA's Gur has pointed out, the Z8K's open nature means you'll need a variety of other modules to get the most out of it. 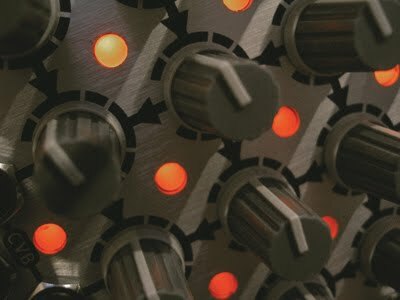 Clock dividers (A-160/ 1, 4MS Rotating Clock Divider or Flame Clockwork), logic, sequential switches or a multiplexer like Doepfer's A-152, not to mention a quantizer or two, would make excellent companions. Given the voltage addressing capabilities of the A-152, a random source or a joystick would also expand the patch permutations. The wealth of possibilities on offer might seem dizzying or daunting, but if you have the head and the supporting modules, the Z8000 could be sequencer heaven. I do not work for Schneidersbuero, do not get paid for my tests and I am certainly not Andreas Schneider! I am a long-standing customer of Schneidersbuero and, when I'm particularly interested in a module, Andreas generously allows me - as he does others - to try before I buy. As I might only have a weekend to get to know a module, I make as many recordings to document its strengths and weaknesses and help my purchasing decision. I've found these tests enormously useful and figure others might too. Hence, the blog. Naturally, in thanks for the loan, I pass my posts on to Andreas and this is why they will occasionally also appear on his blog, Stromkult. The modular community, whilst currently experiencing a boom, is relatively small and manufacturers, dealers and retailers need all the support they can get. One last point. I don't always buy the modules I test! This would not be financially possible and, truth be told, once the initial rush of GAS has evaporated, I often find I can do without the latest whizz-bang and make use of the modules currently in my two-case system. Thats it - now, back to the modules!